For sailboat owners rethinking their vessel's electrical system, the broad and expensive range of equipment and technology touted by the industry as vital for their safety and comfort can be overwhelming. There is, of course, no single perfect electrical system for small sailboats. The system you need is determined by how much electricity you consume; and the system you get is determined by how much you are willing to spend. The two are not the same. You can empty your wallet to buy electrical components that will fulfill virtually any technician's desire, and still not have the power you need; but you can also design a simple, safe, and robust electrical system that will fulfill your needs at a reasonable price. I'm writing about this subject not as an electrical engineer but as someone who has lived and traveled with his family on a sailboat for about five years now: first on the east coast on a Pearson Triton, now on Mason 43 in the Pacific. We've learned much during that time. And during that time, we've also spent fewer than fourteen days plugged in at the dock. In fact, we spend so much time at anchor that we no longer have a dockside power cord. This does not mean that we're Luddites in matters electrical. While we certainly don't waste power, our addiction to electricity is undeniable. For emergencies, we own a single hurricane lantern (I would need to look for it). But the splendid kerosene trawler lamp that came with the boat proved to be as troublesome as it was beautiful and has been replaced by a fixture from Ikea -- with an incandescent bulb, no less, because we like the glow. We run our laptops and navigation equipment; we charge our digital cameras and handheld radio; we make plenty of use of the sewing machines, and, when the need arises, the drill, the angle grinder, the soldering iron and the heat gun (admittedly, not all at the same time). And we keep most of our perishables cool and some of them frozen. In principle, our system -- built around a large bank of batteries, a portable generator, and an inverter/ charger-- will work as well on 28' boat as on a boat 48' long. I don't actually know how many amp-hours we consume. But, I am happy to report, neither do I find such knowledge necessary. exactly the best place to carry such weight. The heart of a sailboat's electrical system is its batteries. Keeping in mind issues of weight, space, and location, it makes sense to get the biggest bank of batteries you can fit on your boat. Regardless of your expected daily load , the larger your bank of batteries, the less deeply they will be discharged, and the longer they will accept high levels of charging. There is no good reason to divide your house batteries into two banks -- not only will this complicate your wiring, it actually increases the wear on individual batteries and makes charging less efficient. If problems develop with one of the batteries in your single bank, you can bypass it. You don't need to get the most expensive batteries out there. On Simplicissius (our Triton) we had two expensive AGM batteries and spent plenty of time in the dark (for which, however, I can only blame our naive faith that solar panels alone would get us through Fall on the Chesapeake Bay); on Momo we use eight Trojan 105's, which are standard flooded 6-volt golf cart batteries, and have never had a problem. Theoretically, this bank yields 860 amp-hours and costs about $720. Nothing did more to convince us about the virtues of the Trojan 105 than watching it in action. In Ensenada we shared an anchorage with friends who were rebuilding their 120' ferro-cement ketch. Using arc welders, drill presses, table saws and other heavy equipment, they subjected their bank of Trojans to an abuse much more intense than any cruising sailboat could ever deliver, torturing their batteries to the brink of death almost every single day; and they always recovered. Newer battery technologies, like Gel or AGM, might very well be better: they accept larger charging levels and deliver more power faster; they also have a lower rate of self-discharge than flooded batteries, although this does not matter if you're actually using your batteries every day. Building a bank with Gel or AGM batteries, however, costs more than twice as much as with flooded batteries; and the larger your bank of batteries, the less significant are the advantages offered by newer battery technologies. Your engine might very well start better using a single AGM battery than a single flooded battery. But if you have eight batteries, who cares? Likewise, you may be able to charge a single AGM battery more quickly than a single flooded battery. But the equipment needed to attain a similar degree of charging efficiency on a large bank of batteries is more than we can afford anyway. In any event, if you need to make a choice, it is better to have more amp hours using flooded batteries than fewer amp hours using Gel or AGM batteries. In two important respects, newer battery technologies are actually at a disadvantage when compared to their flooded counterparts. The first is that, because they are sealed, Gel and AGM batteries can't tolerate being overcharged. If your system starts overcharging your expensive high-performance Gel or AGM beauties, it will toast them. In contrast, flooded batteries require periodic over-charging as part of their regular maintenance. During this process, called equalization, they vent off explosive gases -- a fact which scares some people. But since these gases are lighter than air, as long your battery boxes are ventilated, they will dissipate. Moreover, if your bank of batteries is large enough, I doubt your charging system will ever bring them to a vigorous boil. Ours most certainly cannot. A second advantage that a battery like the Trojan 105 enjoys over its more sophisticated competitors is that people play golf all over the world, and they need golf carts. Thus, if you ever need to replace your batteries outside the USA, it will be much easier to find something that fits your boxes than if you used batteries with more exotic dimensions. Keep this in mind, too, if you're considering those most aristocratic of flooded batteries produced by Rolls-Surrette. They, for instance, list three distributors for Central and South America -- two of which, however, are actually in Nova Scotia and Florida. You can compare the distribution networks of your favorite brand of marine batteries on the internet. That single bank of Trojan 105's is the only battery bank we have -- we use it for everything, thereby flaunting conventional wisdom that stresses the importance of reserving a battery bank for the sole purpose of cranking the engine. In the past we had two batteries dedicated to that task, but found it irritating to carry around an extra 120 lbs that did absolutely nothing. When those batteries bit the dust, we simplified our wiring. 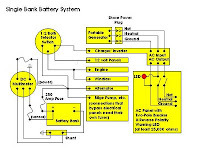 While it is very important to have a way to start the engine if you run your house batteries into the ground, setting aside a dedicated battery bank is not the only way nor is it necessarily the best. Neither is setting up two battery banks all that simple. Doing so in a way that preserves their independence and assures that each gets the charging it needs is rather complicated and requires parts that are expensive and will no doubt eventually need to be replaced. Thus, it violates the axiom that simple is good. One method involves the use of a second alternator (the cheapest Balmar alternator weighs in at around $450) . Another method using a single alternator requires something like Balmar's Digital Duo Charge($250), or Blue Sea's BatteryLink ACR ($93). Either way, you'll need to invest in battery switches (starting price around $40 each), extensive lengths of heavy duty cable (1/0 gauge wire costs over $9 per foot) and other incidentals. Maybe you'll need Xantrex's Zapstop Alternator Protector ($28). You might also want something like Xantrex's Digital Echo Charge ($130), which allows you to charge your starting batteries automatically through your inverter. Otherwise, you might find yourself in the same position we once did -- with dead starting batteries because we sat around at anchor too long without running our engine. Those interested in setting up two battery banks can find advice in any number of excellent guides to electricity and boats. But before you get smug about having a bullet-proof two-bank system, let me just say that if you are relying on your engine to charge your batteries and something goes seriously wrong with either your engine's charging system or with the engine itself (let us count the ways), your second bank of batteries won't do you much good for very long. In contrast, setting up an electrical system from a single bank of batteries is comparatively straightforward. 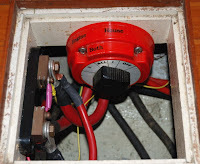 On Momo, the positive cable leads directly to a 250 amp fuse -- it is surprising how often, even on a vessel with plenty of complicated wiring, such a fundamental safety measure is overlooked. From there it leads to a distribution post. The output from the alternator is wired directly to this distribution post, thus it is impossible to break the alternator circuit while the alternator is running. This protects the alternator and makes a snubber like Zapstop superfluous. Another cable from the distribution post leads to a battery switch, which directs current to (1) the engine starter or (2) the electrical panels and inverter or (3) both simultaneously. The battery switch is not strictly necessary, but if there is major problem with either the engine wiring or house wiring we can isolate them. As far as the basic wiring goes, that's about it -- the number of connections are minimal, as are the number of parts. To monitor our electrical system, we splurged on Blue Sea's 12 volt digital multimeter, which costs a hefty $220 (you can make your own for considerably less). Whether we want to make sure that the multi-stage regulator is functioning properly or if we've left something on again, it tells us tells us everything we need to know -- the voltage of our battery bank, how many amps are flowing out, and how many amps are flowing in. And if the voltage falls too low, it sounds an unpleasant alarm that sounds much like my mother's cell phone. Another $100 or so will buy a battery monitor that will tell you more, but if you don't keep it properly calibrated (which is difficult if you don't regularly plug into the dock) it will tell you much, much more. When we bought our boat, it had a nifty monitor that also kept track of the battery bank's amp hours; but not long after we left the dock it developed an increasingly powerful imagination. Soon it was reporting an abundance of power even as the lights were growing dim. In short, while a monitor that calculates amp-hours promises a direct report of the battery bank's remaining capacity, it cannot be completely trusted. Once you get used to the fluctuations of your system under various loads, you can gauge your system's health more reliably based on voltage and current readings alone. A sailboat's engine provides its most powerful means to charge its batteries. But before laying out substantial sums to optimize your engine's generating capacity, keep in mind that regularly using your engine for that purpose is unwise. Charging your batteries while motoring is fine. But few things lead more quickly to the premature demise of (very expensive) diesel engines than running them for long periods without sufficient load -- i.e., repeatedly charging batteries with your engine while at anchor. Thus if you have a limited amount of cash to spend on your charging system, don't stick it all in the engine compartment, or -- more sooner than later -- you'll find yourself replacing the engine, too. Certain authorities eager to sell you things suggest that your engine alternator's rating should be equal to 25% to 40% of your total battery capacity. Nonsense. On our boat, that would mean an alternator that puts out from 215 to 340 amps, and costs between $940 and $1850. Of course, we would need to invest in an appropriate regulator and heavy duty wiring as well. Even if we were prepared to fork over that much cash, I don't think our little Perkins could handle it. High-output alternators are not always a good thing. In a tight engine compartment they can generate far more heat than can be dissipated and thus burn themselves up. They could also impose loads that your engine's belt and pulley system cannot withstand. Friends of ours on 35 ft. boat with a 30 hp. Yanmar, fitted out for a tour through the South Pacific, found themselves regularly replacing their aluminum pulleys on their (admittedly aftermarket) water pump because their 70 amp Balmar imposed too great a load. Our alternator never puts out more than 70 amps, and we've never had a problem and could get by with less. While motoring along for any length of time, a gentle and less expensive alternator will get the job done just as effectively and much less stressfully than a high-output alternator. And if the boat is at anchor, you should probably find some other way to charge your batteries. Our alternator is 'marine' quality (for what it's worth) and uses an multi-stage external regulator. But I think that a heavy duty automotive alternator would function just as well, particularly if hooked up to a decent external regulator. Disparaged though they are, I've heard good reports from people using such alternators. While chandleries like to stress the rigors of the marine environment when touting expensive 'marine' products, churning away under the hood of a vehicle for two hundred thousand miles through all kinds of weather and terrain is no mean feat. I suspect that the major reason automotive alternatives are so much cheaper than "marine" alternators is that the former are mass produced. Automotive alternators are generally not ignition-protected, which is a problem on boats with gasoline engines; but neither are all 'marine' alternators (especially older ones). But don't despair -- the automotive-industrial giant, Delco-Remy, also produces alternators that are ignition protected, namely the 5SI (50 amps) and 7SI. (70 amps), described as off-highway alternators suitable for marine applications. Priced around $200, the Delco-Remy 7SI costs less than half of a comparable alternator built by Balmar and its warranty lasts twice as long. Settling for a portable generator makes this struggle much easier. Our Honda weighs about 45 lbs. We can take it to the beach, lend it to friends, and keep it in a cockpit locker. It is reliable, efficient, and built by a company with a reputation for producing quality equipment for a mass market. As the basis of a system which charges our batteries, the generator is completely independent -- it starts by hand and even uses a different kind of fuel from the engine (which is important since contaminated fuel knocks out diesel engines more than anything else). In a pinch, the generator will charge the batteries even if our charger fails. It generates all the power we need, loping along at less than half of its rated capacity to run our battery charger at full strength. Thus, when we run the generator, we usually make a point of charging all of our other battery-powered devices as well. We plug the generator into the boat with a modified shore power cord and charge our batteries with a Heart Interface EMS inverter/charger. The inverter draws from the batteries to deliver a maximum of 1800 watts of 120 volt AC; as a charger it pumps about 60 amps back into the batteries, ramping down in stages according to the batteries' needs. While we're happy with our charger, we wouldn't object to one with a capacity of 75 amps -- but nothing higher. A comparable unit costs between $1000 to $1300. You can pay significantly more for units whose AC output is a pure sine wave, but we've never had any problems with the our inverter's modified sine wave -- even when running our navigation computer (which uses a desktop power supply). You can buy stand-alone chargers for less, although they generally have less output as well. By the time you're looking at chargers that put out 50 amps or more, the price difference between chargers and inverter/ chargers is negligible. A number of people we've met who ran their generators through chargers that only delivered 20 or 40 amps regretted not having chargers with larger capacities. One friend who only had a 20 amp charger wound up charging his batteries with his engine much of the time -- precisely what he was trying to avoid. A major reason why people leave the dock with low-capacity chargers was because they had been warned that their generators would not be able to handle anything more powerful. Indeed, Xantrex insists that to operate a 50 amp charger at 12 volts, the generator needs produce at least 3.5 kW, citing the difference between inductive and resistive loads. Faced with such science, I can only say that before we purchased our 2kW Honda, we routinely ran our 60 amp charger on a 1kW Yamaha generator without any problems at all. Poking around the internet, I've discovered that others have had similar experiences. Go figure. As for 'greener' charging technologies -- i.e. solar panels, wind generators, or hydro generators -- we don't have any. All three remain expensive and are at best supplemental sources of power. Wind generators are large and noisy, and hydro generators add a level of complexity to passage making we don't want. We like the idea of solar panels, and used one on our Triton. But on Momo, although we have thought long and hard about the best way to mount them, we haven't found a solution we like. If we needed solar panels, we would have figured something out. In fact, however, the portable generator has proven so economical and easy to use that we've always found other ways to spend our money. Generally, we run the generator every second or third day. We also run it while passage making, propping up one end on a cockpit cushion to compensate for the boat's heel. Often we'll just run the generator in bursts. If we need to run it for more than hour, we'll wait until we watch a movie on the laptop -- it's quiet enough that we only notice its purring when it stops. The only time we run the generator for longer than 2 hours is when we equalize the batteries, which we do every month or so to keep our batteries healthy. We carry two six-gallon gasoline jugs, which our generator and small outboard need to share; this supply lasts around six weeks. On our trip to Alaska this summer, during which the Perkins and its alternator saw plenty of action, those twelve gallons lasted more than three months. Designing an electrical system on a limited budget means focusing on what you need to get the job done and resisting the allures of technological sophistication. Keep in mind not only the cost of your initial installation, but also the expense and difficulty of repairs and replacements. Before buying those vaunted AGM batteries, which were designed to withstand the G-forces of military aviation, ask yourself how frequently you'll be sailing your boat upside-down. Before spending vast sums to set up the most powerful charging regime your batteries can withstand, consider that, even with a moderate charging capacity, it doesn't take long before your voltage regulator starts ramping current levels down anyway. And don't worry too much about not attaining self-sufficiency because you need to buy gasoline for your generator; remember that, every now and then, you need to buy groceries, too.